Colorado Blue spruce typically reaches a height of 30′-60′ (it can become taller) and spread out 10′-20′. Its silvery-blue needles are prickly to the touch and aromatic. Its pyramidal shape makes it a classic choice for a Christmas tree. Colorado Blue spruce trees don’t need to be pruned, but they can be pruned if you wish to promote denser foliage. Colorado Blue spruce trees are valuable in deer country, as their prickly texture and strong aroma render them conveniently deer resistant. 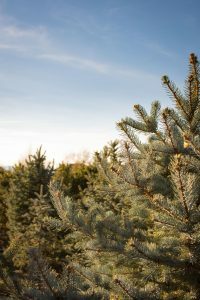 In snowy climes, where landscapes can look barren in winter, evergreens such as Colorado Blue spruce trees can provide much-needed winter interest. 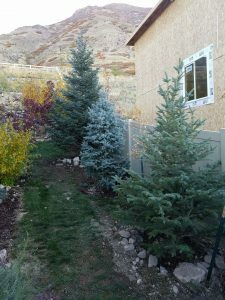 They’re one of the best fast growing trees Utah, typically growing between 12″ and 24″ each growing season. 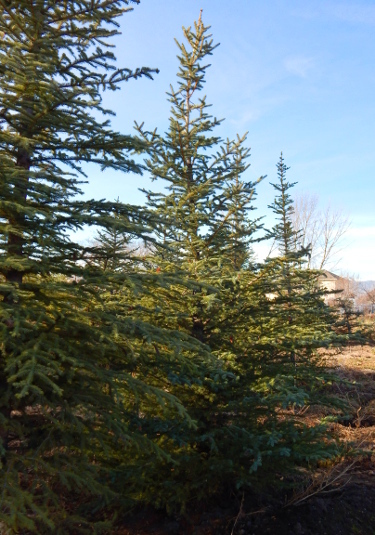 Besides our Colorado Blue Spruce, our Austrian Pine trees are a great choice for fast growing trees Utah. Both of them grow at a rate similar to the Blue Spruce, but have very different appearances. The Austrian Pines we sell can either be layered or non-layered, as featured below. The Bristlecone Pines are generally more full than the Austrians and serve as great wind breaks or privacy trees. All of our trees are wonderful choices for beautifying your property, adding value to your home, and giving you peace of mind.